News: Qantas now gives frequent flyers a 5000 point bonus at 450 status credits, upgrade credits no longer exist. There is the Qantas Frequent Flyer scheme, where you earn points for each mile you fly, and the Qantas Club, which you pay to join, which gives access to the business lounges. It is part of the OneWorld Alliance. The Qantas loyalty scheme is more complicated than that at many other any airlines. There are separated earned points (which earn miles to spend) and status credits (which earn tier levels). Four tier levels, buying points for one off perks, lifetime membership, the added complication of the Qantas Club and the wacky fact that you can add some, but not all, Star Alliance airlines and Skyteam miles to Qantas Oneworld points, which mean that a trip to the airport is spent thumbing through the hefty 85 page Qantas manual to see what you can claim on which scheme. There is no expiry date on your Qantas Frequent Flyer points - provided you earn or redeem points from your account at least once every three years. 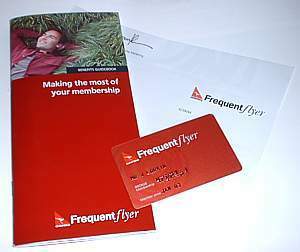 Thankfully, Qantas have avoided the policy of giving the scheme a daft name, and its just called the Qantas Frequentflyer scheme. The scheme, unlike most airlines, is very reliably managed, and you can usually trust points to be credited on time. 3,660,000 people are members of the scheme. Qantas now refer all new British resident customers, wishing to join it's frequent flyer program, to the BA Executive Club, however if you hassle Qantas's UK office in Hammersmith (by phone) they will grudgingly let you join, and join for free too. Members in Australia have to pay to join at just over AU$80, while in New Zealand NZ$50.00. Outside these countries, there is no membership fee for joining the Qantas Frequent Flyer program. A useful dodge is that in Australia if you collect Woolworth everyday reward points, you get to join for free. A magazine is Emailed every month or two to all members, including those in the UK. It contains a lot of special offers, for flights and hotels that are half price that month to Qantas members. One Point is earned per mile on Qantas flights, plus all Oneworld airlines. 1.25 points are earned in Business Class (but not on flights upgraded to business class). A point is also earned on SAS, US Airways, Swiss, and Alitalia flights. A minimum of 1000 points is credited, even if the flight is only a few miles, except for BA flights, where BA rules apply. For example, you only earn 125 miles for a short, UK domestic flight. Status Credits are earned on all flights including extreme cut price (Y class) economy fares, and even on very short hops of just a few miles. Status Credits are also earned for BA flights, and other Oneworld flights. You earn 10 Status Credits for flights up to 600 miles in economy, 15 to 1200 miles, 20 for longer Oz domestics, etc. They reset to zero on the anniversary of your joining. So even if you have 340 points and are going to fly the next day - tough. See box above for status credits earned. Status credits (known until recently as Tier Credits, until too many people started crying over them) determine your membership Tier. You rise from bronze to silver to gold etc, the more flights you take in your membership year, and you drop down again if you haven't taken enough flights to maintain that level in the year. Initially you start at Bronze level. Qantas now gives frequent flyers a 5000 point bonus at 450 status credits, in a replacement for the old upgrade credit system which no longer exist. Beware of the wacky Qantas rule, that if you stick with a flight code, even on a codeshare, you only earn one status credit level point addition. This means its worthwhile adding an extra hour to Singapore stopovers or booking under BA codes, so you seem to take two flights, even if its on the same aircraft. If you fly a lot in discount economy on BA, it can be well worth while putting your miles on a Qantas card. You will find it hard to earn status by flying on BA with these tickets, but your can (slowly) earn status with Qantas. Qantas organise the world into zones with internal flights in zone 1, onto a sliding scale of 2 from Perth to Sydney, Singapore or Sydney is zone 3, up to zone 10 for a flight from LHR to SYD. All award bookings are for return flights - you can't book a single jouney. The chart on the right indicates the redemption levels. 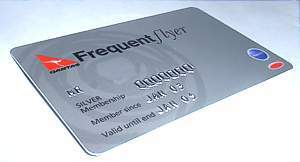 Anyone can join Qantas' Frequent Flyer scheme online, and when you join you'll be a Bronze member. As soon as you take your first flight on the scheme after joining you are sent a proper plastic card and (the vital!) manual. Even if you are in the UK this is reliably sent to you only a few days after your first flight - so long as you hassle Qantas to let you join the scheme from the UK. News: Qantas have slightly reduced the renewal threshold for Silver, from 300 Status Credits to 250 Status Credits. Qantas Frequentflyer Silver level is equivalent to Oneworld Ruby Level. It can be achieved at 300 Status Credits in any year to the aniversary of you joining. To renew it you need just 250 points (a slight reduction from last year, when 300 was needed). However, you will also need to fly on four Qantas flights. There's check in at the Business check in desk and priority on the waitlist. You can take an extra 10kg of luggage onto Qantas International flights. You can also earn a 25% point bonus (or 10% on BA World Traveller Plus). Theres a hefty pack which accompanies Silver level. 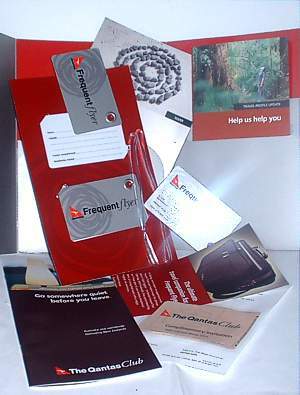 It contains another manual with all the extra benefits, various sales flyers, two luggage tags (with very poor plastic ties - I prefer the string ones bmi hand out) and a letter with a detatchable pop-out card at the bottom which gives you one visit to the Qantas Club. This level is equivalent to 3 economy (120x3=360) return flights from LHR to SYD in one year. If you earn 7,000 Status Credits in a lifetime you get lifetime Silver level. Qantas Frequent Flyer Gold level is equivalent to Oneworld Sapphire Level. It can be achieved at 700 Status Credits in any year to the aniversary of you joining. To renew it you need just 600 points. You can get into the business lounge, even if you are on economy. There is also a 50% point bonus. There is a soft landing from Gold to Silver, so even if you don't quite achieve Silver in the following year, you only drop down one level. If you earn 14,000 Status Credits in a lifetime you get lifetime Gold level. After 1400 Status Credits you get Platinum (called Emerald under the OneWorld Alliance) which brings the First Class lounges even if you are travelling economy. You can sign two guests into a Qantas business lounge and one into Qantas First. There is also a 100% point bonus. You need 1,200 to retain it. There is a soft landing from Platinum to Gold, so even if you don't quite achieve Silver in the following year, you only drop down one level. A major change for Qantas is that Anytime Access has been removed. You can no longer get access to the QantasClub unless you are on a oneworld flight - previuously you could get access on any flights. When this was removed it caused much angst among the Platinum set. Qantas Platinum One is the latest status level from Qantas. To get to these kinds of lofty levels, you need to achieved 3600 Status Credits. Naturally, this is matched to Emerald under the OneWorld Alliance, and there is the right of access to all the usual First Class lounges even if you are travelling economy - but then, this is unlikely, considering you'll have spend many months in the First Class cabin to get here. The real benefits are access to what Qantas is roughly calling a dedicated contact team - it's rather like being part of the Gold Guest List on British Airways. Qantas also promise access to Qantas wine tasting evenings, and even a trip in a Qantas flight simulator. There are two ways of upgrading your flight to the next class of travel by using your miles. The usual way is to use miles to upgrade your class of travel, so long as you are not travelling in discount economy in N, O or Q class (normally Red e-Deal). Domestically, you need to buy at least a discount economy ticket in classes L, M, R, S, V (Normally super saver or above). 12,000 for zone 2, 16,000 for zone 3 (which includes the Sydney to Perth flight - quite good value - or Sydney to Cairns - poor value, but at 1225 just into Zone 3) and 96,000 for zone 10 (back to Blighty) if you're upgrading a cheap economy ticket. Note that if you are on a two-sector flight, you have to pay to upgrade each sector individually - there is no way to avoid this, and fudge a two-sector upgrade with the points just from the origin to the destination alas. It's cheaper if you upgrade a Fully Flexible (classes Y, B, H) and Flexi Saver (class K and W) ticket - for a flight to 600 miles it takes with 5,000 miles for a zone 1 upgrade, and 7,500 for zone 2, and 60,000 for zone 10. You can now upgrade online. Just make a booking, go back to the welcome screen, select "your bookings" from the drop-down menu, and then click on the link by your booking to upgrade. However Qantas have recently made it much harder to book and upgrade your booking at the same time: it used to be a one step process, but now you need to check to see if there are any classic award seats available on the exact flight you don't know you'll book yet - by making a dummy booking. Then, when you've found some, you can make the booking, but you need to make sure you avoid the booking classes that you can't upgrade from. These are E,N,O,P,Q, or X. These exclude most Red e-Deal fares. Of course Qantas aren't going to do anything as simple as telling you this, or indeed which flight class you are booked into. To find the flight class, on the Passenger details, you can click on the fare type, or down on the fare conditions: this generally tells you if the ticket bucket is upgradeable. It's equally hard to work out how many points you need to upgrade a flight. The upgrade chart is hidden away. On an upgraded ticket, you get all the benefits as if you had bought a business class ticket, such as for example access to the new Business Class lounges, however you do not get the Status Credits or Miles from your new upgraded class - only the credit from your originally purchased ticket. Don't attempt to give a different Frequent Flyer card from a different airline when you check in: the "foreign" airline will not award you any miles from these upgraded tickets, and will treat them like award bookings. The second way of upgrading is to use Qantas Anyseat Flight Upgrade Awards. Here, you are in effect 'buying' the seat, and this is much more expensive. You should only do this if Classic Upgrade Awards are not available. Upgrade Credits no longer exist - they were previously used with 1 Upgrade Credit for internal flights (zone 1), with a sliding scale of 2 from Perth to Sydney (zone 2), up to 5 for a flight from LHR to SYD (zone 5). Of course, if flying enough miles isn't for you - there is a quicker way to get into the lounges. Buying membership of the Qantas Club, which is a different, but connected, part of the Qantas Frequent Flyer scheme. If you get up to Gold on the Frequent Flyer scheme then you get membership of the Qantas Club for free: otherwise it'll get you into the lounges even on an economy ticket, both domestically and internationally. On an international flight you also get admission to the British Airways Terraces lounges, and American Airlines lounges on an economy ticket. An Annual Guest Card allows you to take one additional guest into The Qantas Club on each visit. They are issued in the name of the member and are valid for 12 months.